Ethereum Classic is an open-source, public, blockchain-based distributed computing platform featuring smart contract (scripting) functionality. It offers a decentralized Turing-complete virtual machine called the Ethereum Virtual Machine (EVM), which can execute scripts using an international network of public nodes. 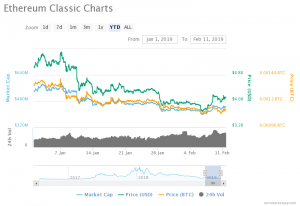 Ethereum Classic (ETC) the 18th largest cryptocurrency having its current market cap trades USD 446,130,294 (12:46 UTC) on February 11 dropped in current value by 29% relative to January 06 as analyzed from the graph above. The strong bearish pressure caused a decrease in the amount corresponding to January 06 which can be easily estimated from the chart above. The ETC/USD pair gained in value by 14.8% relative to December 06 which can be expected from the graph above. Let us not forget that amid the recent scenario the ETC /USD pair remained ‘uptrend’ from December 18 to January 06 as interpreted from the graph above. As we can estimate from the chart about where the current value traded almost adjacent to the 20-day EMA and expected to cross it thereby creating the bullish trend – Uptrend soon. Let us discuss certain milestone that this cryptocurrency attained in the recent past. The ETC /USD pair remained range bound from December 16 to December 25 last year, as the cryptocurrency rallied from a low of $3.910 to a high of $5.781 which is a 47.85 percent return within nine days. As we can quickly examine from the graph above that the MCap trades at USD 446,130,294 (12:46 UTC) on February 11 with the Price (BTC) 0.00111998 and Price (USD) is 4.10 through orange trend line with 24h Volume 180,030,651USD (12:50 UTC) can be interpreted from the graph above. If we can estimate from the graph above, the Price BTC traded all-time high on January 06 above both MCap and Price USD, and since then it dropped. From January 07 to January 10 Price USD took the lead, however, after that, Price BTC traded almost above all. However, based on the first graph, since bulls has been succeeding by trading above the current resistance level $4.14 (13:01 UTC) (i.e., price traded above the EMA) the investors will keep buying this currency more and more thereby increasing its value. However, based on the current trend, the next support level could be $4.25. Ethereum Classic (ETC) is a smarter blockchain with a network, a community, and a cryptocurrency that takes digital assets further. Additionally, it allows people to send a value to each other. It also allows for complex contracts that operate autonomously and cannot be modified or censored. When the Internet was merely a bunch of interconnected computers and didn’t have any users or creators making websites, it would be mostly useless. Let us not forget that ETC has both and it is continually working on solving real-world problems of interconnecting people and their devices. Please feel free to visit https://ethereumclassic.org/ to know more about this cryptocurrency!